Few days back I watched a fascinating movie called "Afterlife" starring Matt Demon. The story based on three characters had two undergo a near death experience after which one gained the power of a clairvoyant while another felt an epiphany. The story that touched me most was of the third character who lost his twin brother in an accident and how unable to cope up with the sudden loss, he went on a solo expedition to find a psyche reader who would help him communicate with his dead brother. It was interesting the way the story was built and developed. First time the movie was telecast around midnight and the thought of having to watch a supernatural movie all alone while my hubby sleeps made me give up the idea of watching it then. Later on another day in the evening I caught it by chance while shuffling channels. I love horror movies and needless to say, I was quite fond of the Ghost Hunters series. Now as a side effect of watching too many horror movies over the last one decade, I have started imagining a lot and feeling scared. If a sudden gust of wind creaks a door open, I jump out of my bed. Slight rustling of leaves nearby sends a shiver down my spine. I feel scared at night to see myself standing in front of a mirror. It's funny I know but I know few people who, equally fond of horror movies, suffer from the same kind of delusional fear. We have never gone through any unearthly experience ourselves, but the baseless imagination, inspired by the movies, has instilled an irrational fright in our minds. Just few days back, one of my friends told me that she has stopped watching horror movies after one day she got awakened by a dream of an old lady sitting at the end of her bed. I have my own way of dealing with such fears which I would describe later. Not today, but I will narrate one incident one friend of my own sister in law went through. It scared me stiff. 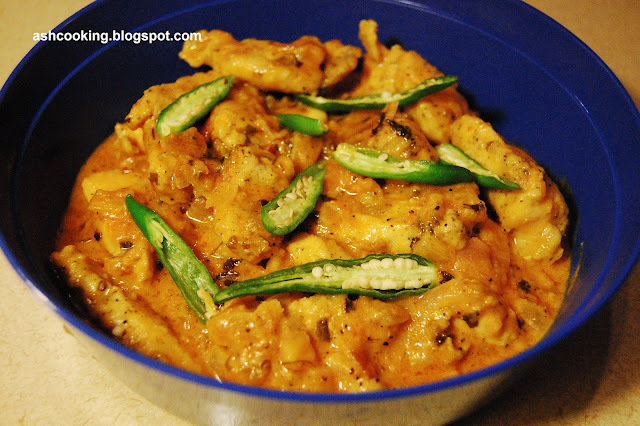 Back to the recipe, Chicken Lababdar is one of my favourite chicken preparations. Back home, I often used to place order for it in a restaurant. It goes heavenly with a platter of pilaf and naan. Ingredients: Cooking time: 1 hour approx. 1) Marinate the chicken with salt, pepper powder, egg and cornflour. 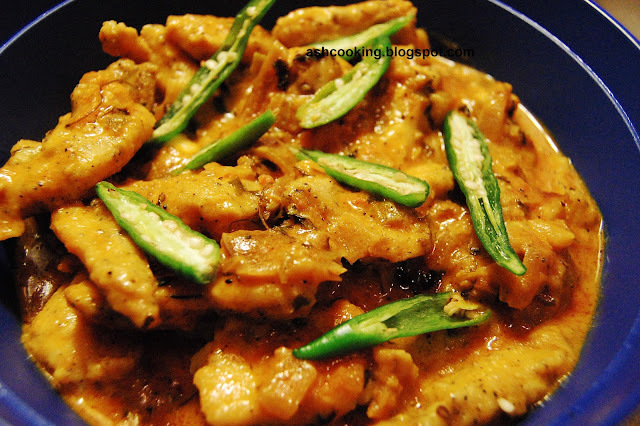 2) Heat oil in a non-stick skillet and shallow fry the chicken pieces on medium heat. Take them off the flame and keep aside. 3) Heat oil in a wok and when oil turns hot, add onions and fry till they turn golden brown in color. 4) Add turmeric powder, red chilli powder, green chilli paste and coriander powder. Sauté. 5) Add chopped tomato, tomato puree and tomato ketch-up. Mix in and sauté till oil floats on the surface. 6) Add sugar and honey. Mix in. Pour 1/2 cup of water into the mixture and bring it to a boil. 7) Slide the chicken in. Add cheese, cream, salt, black pepper powder, cardamom powder and kasuri methi and toss them together. 8) Cook covered on low flame for 2 minutes till all the ingredients assimilate and a beautiful aroma of kasuri methi touches your nostril. 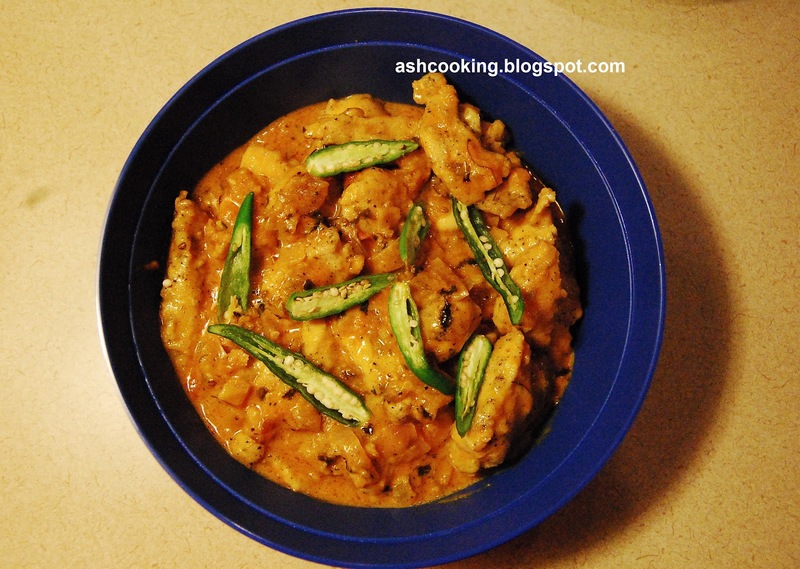 9) Garnish with green chillies (split lengthwise). 10) Serve hot with roti or chapati, paratha or naan.